It’s the spookiest time of the year for people and their pups! Candy, costumes, and kiddos are everywhere you look- it’s enough to drive anyone batty. Some dogs deal with all this extra excitement well, but lots of dogs find Halloween extra scary. Even if you don’t participate in the pandemonium, it’s important to make sure your four-legged friend feels safe. Here are some of the top tricks & treats to watch out for, as well as some tips for handling them! Pet costumes: That hot dog outfit may be the cutest thing you’ve ever seen, but your pup probably disagrees! Always look for signs of discomfort when dressing your dog in anything- they’re not as obvious as you might think. Growling or nipping is a sure sign that your dog is not interested, but you also want to watch for lip licking, “whale” eyes, and panting without exercising first. Trick-or-treaters: One of the best parts of Halloween is seeing all the cute kids dressed up and having fun! But dogs have a hard time recognizing removable “parts” like hats and candy buckets, not to mention crazy masks or flashing lightsabers! It can be really scary when these monsters keep ringing the doorbell or knocking- if your dog is easily spooked, consider keeping him in a room where he can’t see the people at the door. You can also give your dog a chew or feed him dinner out of a puzzle toy so he has something else to focus on! Going trick-or-treating: Taking your dog along with the kids is a great way to get their evening walk in, right? Well, maybe! 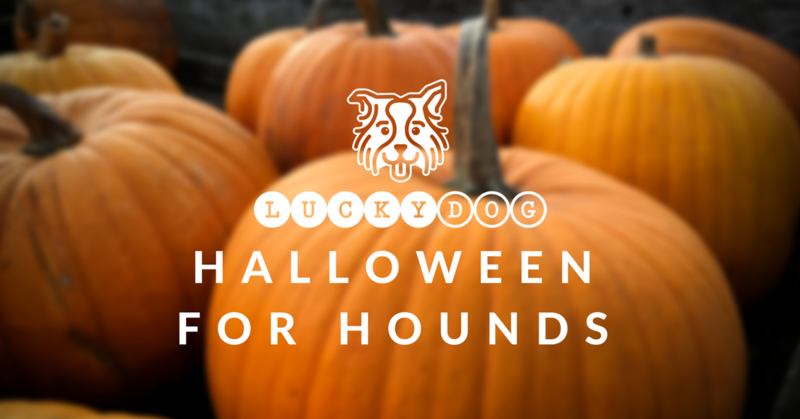 Plenty of dogs love going trick-or-treating with the family, but most dogs would rather not. Costumes are scary, yard decorations are scarier, and just about everything makes weird and unexpected noises. If your dog is a fearless superhero, then have at it (and show us pictures!). Opt for a harness instead of a flat collar and take lots of treats along. But if your dog is more of a scaredy-cat, let him stay home! You’ll both have a better time- he won’t be stressed, and you won’t have to worry about him. Candy: Chocolate is the most popular candy to dish out on Halloween. That’s great news for those of us with a king-sized sweet tooth, but not so great for our dogs! Make sure your kids know that chocolate (and other candy) is for people only, not for puppies. If your dog is an unrelenting beggar, keep her busy with a chew while your kids check out their loot so they won’t be tempted to share. And if your dog does happen to get into some chocolate, call your vet immediately. Chocolate toxicity varies by breed and weight but it’s always better to be safe than sorry! Need help finding a good chew? Want to learn more about building your dog’s confidence and managing stress? Come visit Lucky Dog!